The news of the spreading epidemic of an enteric virus causing respiratory disease and now a paralysis in young children is panicking the nation. I am suggesting, as I have in the past during the influenza season, that all of my patients have available the Interferon Alpha for Flu drops and bottles of Monolaurin 600 mg, as well as, 50,000 IU capsules of Vitamin D3. I am again strongly recommending that you have in your possession, these three items, because to my knowledge, there is no other known treatment available. As there is no previous experience or history of the use of the above in this spreading epidemic, we cannot guarantee total success, but it would be a mistake to not at least try. Also, as the influenza season is descending upon us, it would be wise to have this first aid kit available for December, January, and February. Each of us should be taking 5,000 IU Vitamin D3 daily. This will keep your D3 level somewhere between 50-70 ng which is the optimal level to protect us from infection, cancer, and autoimmune disease. If you do not already have the 5,000 IU capsules, please order them today as well. 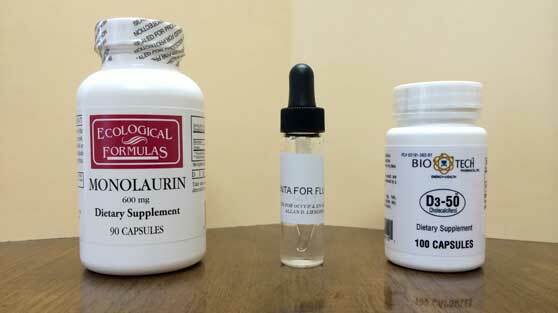 Do not confuse the Vitamin D3 5K IU and 50K IU capsules and dosage. Vitamin D3 50K IU should be taken ONLY when symptomatic. Vitamin D3 stimulates the body to produce cathelicidin, this is an anti-viral and anti-bacterial compound that is naturally produced by our bodies when there is sufficient Vitamin D. But the larger dose of D3 blocks the excessive hyper-reactivity of the immune system, which is what causes death. To place your order today, send an e-mail to orders@coem.com.